Let’s make 2016 an impactful year ahead because you are the creator of your own destiny. So don’t be afraid to be bold and be yourself. Here are a few tips and trends to start the year with a bang with these pretty colourful hangbags, shoes and accessories from Carlo Rino to complement your everyday look. A quirky way to start 2016; it’s time to unleash your fashion fantasy. Well they say when in doubt wear black or white. Most of my wardrobe is quite monotone, it’s either in black, white or gray. Sometimes I wish to add some colors to my overall outfit to gives a little bit contrast and impact. Aha! surely handbags and shoes are our best friend the more the merrier. Girls, we can’t get enough of handbags and shoes. Do you have weak heart when comes to shoes and bags, just can’t resist. Here are some of the latest Carlo Rino bags and shoes collections that were showcased at Sogo Kuala Lumpur recently. The handbags collections available are Delicate Watercolours, Patching Things Up, Beam Me Up, Elegant Classic, Funky Embroidery and Vibrant Shapes. Do you like patchwork? This Patching Things Up tote decorated with city skyline patchwork in yellow. It is quite roomy and the color is vibrant. It’s available in red and royal blue as well. The tote comes with shoulder strap, Carlo Rino charm and trimmed with satin lather. Carlo Rino, a contemporary brand featuring young, colourful, trendy and bold leather goods and footwear. The brand projecting fun, vibrant and an invigorating identity since 1986. As to date, Carlo Rino has 32 and will have 35 boutiques this in 2016 and reaching beyond 200 counters at reputable departmental stores. Here are my recent hauls from Carlo Rino online store at http://shop.carlorino.net I like this beige shopper bag it’s the perfect size carry all for my must-haves items such as my cameras, makeup pouch, water bottle, purse, keys and etcs. It’s perfect for work, play or travel. The 2.5 inch platform sling wedges gives me the height and comfort at RM69.50 only (on sale). I am always on the go at the same time need to elevate my height a little bit. This pair of stylish black platform sling wedges will be my ideal selection. It’s embellished with faux snakeskin print and are detailed with buckles, zips and ankle straps. It’s ideal for work, party and also outing with friends. Hey! there are more awesome and stunning looking bags and shoes for you this Chinese New Year. 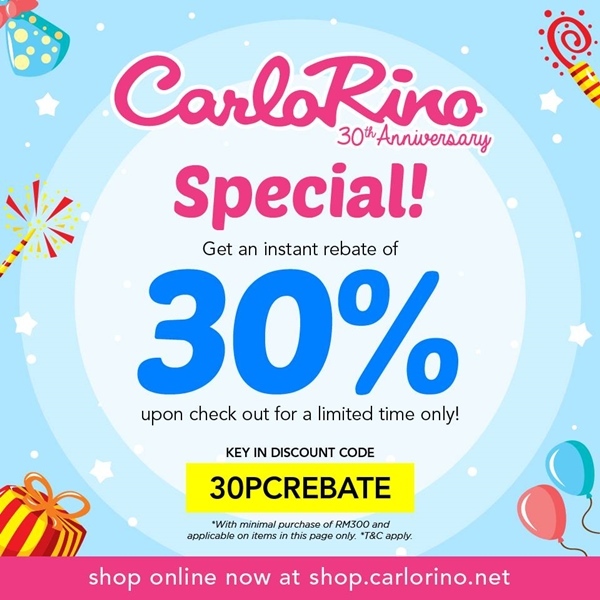 Psst… in conjunction with Carlo Rino 30th Anniversary this year there will be new exciting collections at fabulous prices, freebies, contests and rewards. You can get your instant rebate 30% for a limited time only, terms and conditions apply. So what are you waiting for? It’s a quirky way to start 2016! looking hot babe :) HAPPY coming CNY babe hehe in advanced ! !